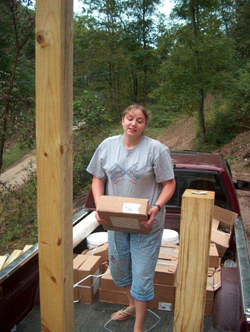 MRC is a 501(c)(3) organization that works to link nonprofit partners of all sizes and manufacturers, distributors, contractors and individuals with surplus usable products by sourcing donations of building materials as well as disaster relief materials, educational resources, household necessities, and medical supplies. Founded in 1999, MRC branched from serving small groups in the mountains of the Appalachian community to working with organizations across the country. Since 2006, Mountain Re-Source Center has distributed over 1500 semi-truckloads of materials from coast to coast and to natural disaster sites as far away as Haiti and Honduras. Ally Venugopal and Victoria Wright install tile at a Habitat for Humanity house in Georgia. 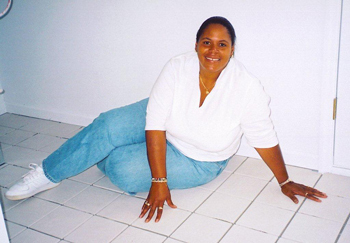 New homeowner Sonja Pania sits in the doorway of her newly tiled kitchen. Amanda Wallbrown receiving a donation of ceramic tile in central Appalachia. 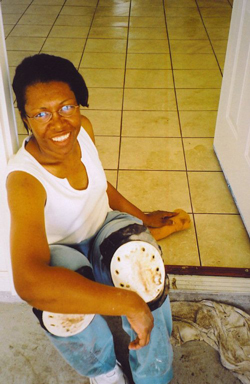 New homeowner Renda Collins sits in her newly-tiled utility. 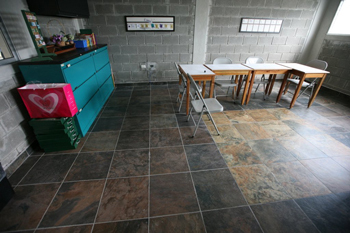 Newly installed donated tile in a school in Honduras.